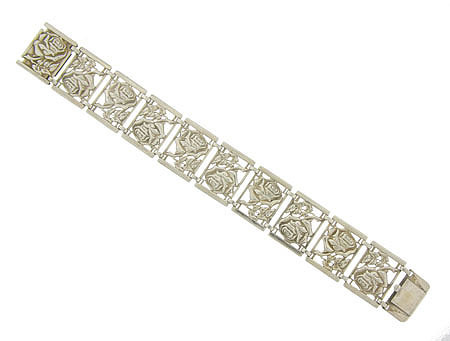 Sterling silver frames filled with delicately engraved cutwork roses form the links on this vintage bracelet. Rings of silver attach each floral frame. The roses alternate in orientation across the bracelet and finish in an invisible lock clasp. This Retro Modern piece measures 14/16" in width, 7" in length. Circa: 1940.